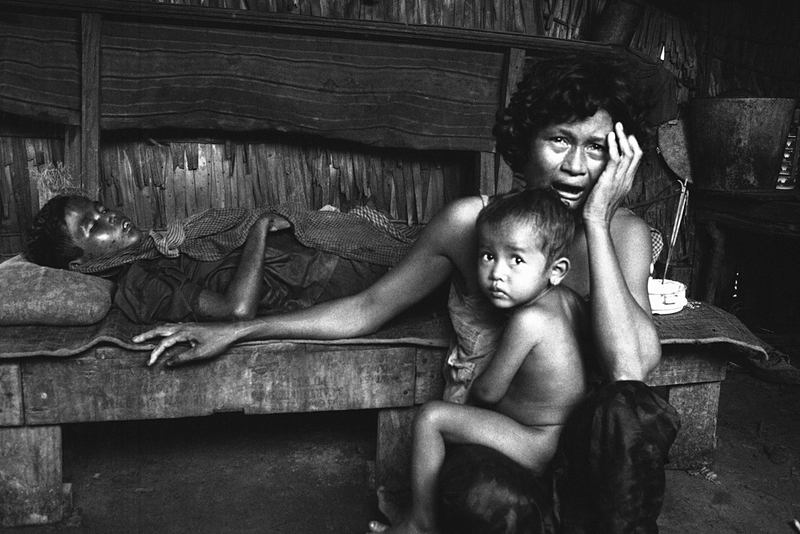 Her son a victim of an insurgent mortar attack, a Cambodian mother cries in grief following the attack on a hamlet in the Kompong Speu area in Cambodia Oct. 20, 1974. While backing the People’s Republic of Kampuchea, Moscow helped rebuild the country that was destroyed by the Khmer Rouge. Russia was also one of the main initiators of the 1991 Paris Peace Accords, which brought lasting peace to the nation. On the morning of March 18, 1970, Cambodia’s Prince Norodom Sihanouk, who was in Moscow to negotiate the exit of the Vietnamese communists from his country, received an alarming telegram from Phnom Penh. Prime Minister Lon Nol, backed by the military, staged a coup and appointed himself the Head of State of the Southeast Asian country. The coup had the covert backing of the Richard Nixon administration, which was smarting from a series of reverses in Indochina at the hands of pro-Moscow forces. The coup d’etat led to Cambodia no longer being a neutral party in the Vietnam War and openly expressing support for the South Vietnamese. The events on March 1970 would lead to a series of wars in Cambodia, which culminated in one of the worst genocides in Asia. Appalled by the coup, the Soviet Union refused to recognize the new government and gave a green light to North Vietnamese forces to invade Cambodia. Sihanouk, who left Moscow for Beijing, supported the North Vietnamese, who invaded at the request of Khmer Rouge leader Nuon Chea. A civil war ensued for the next five years, with the US providing air support to Lon Nol’s forces. The Khmer Rouge finally managed to seize power in 1975, unleashing a reign of terror on anyone considered an opponent. The Khmer Rouge regime, which renamed Cambodia to Democratic Kampuchea, ruled the country from 1975 to 1979. It had the backing of China and was recognized as the legitimate government by most western countries. This arrangement was the result of the Sino-Soviet split and the warming of ties between Washington and Beijing. The Khmer Rouge, led by Pol Pot, initially rounded up and killed Cham and Vietnamese minorities in Cambodia before turning on intellectuals and the urban middle class. The ensuing genocide claimed about 2 million lives. Angered by both the massacre of Vietnamese civilians and threats to the country, Vietnam, with the explicit backing of the Soviet Union invaded and occupied Cambodia, setting up the leftist People’s Republic of Kampuchea in 1979, which later became the State of Cambodia and lasted until 1991. The socialist government was recognized by Moscow but the United Nations still maintained that the Khmer Rouge’s government was the legitimate government in Cambodia. After the fall of the Khmer Rouge, Soviet and East German specialists helped demine the country. The battles with the Khmer Rouge went on till the mid 1980s. In 1983, eight Soviet cotton experts were killed by the Khmer Rouge in the countryside. With a western boycott of the country, it was the Warsaw Pact countries that would rebuild Cambodia. Moscow gave $100 million in aid annually until 1991. The only non-aligned country that recognized and supported the socialist government was India. Victor Samoilenko, a Russian diplomat who was based at the Indochina division of the Soviet Foreign Ministry in the 1970s, told the Cambodia Daily that the reports he received from the country painted a very grim picture. “They wrote back, ‘Cambodia needs everything,’ from plates to pencils. The medical system, the municipal system, the sewage system, water supply, electricity, everything had been destroyed during Pol Pot’s time,” Samoilenko, who would later serve as Russia’s ambassador to Cambodia, told the paper. The Khmer Rouge murdered most of the doctors in the country and for a few years, it was medical specialists from the USSR and Cuba that were treating the ill in the country. At the same time several hundred scholarships were issued for Cambodian medical students in Soviet universities. With the fall of communism across Europe and the impending collapse of the Soviet Union, Russia was one of the main initiators of UN-sponsored Paris Peace Agreement Conference of 1991. On October 23, 1991, the Paris Peace Accords were signed by 19 countries and all the erstwhile warring factions in Cambodia. The accords led to a UN peacekeeping force being deployed in the country and the first ever occasion when the UN became the head of state of a country. In 1993, Sihanouk was reinstated as King of Cambodia. There would be many more twists and turns in the political fortunes of the country but Cambodia has remained peaceful ever since the Paris Accords. In 1995, Russia and Cambodia signed the Joint Declaration on the Foundations of Friendly Relations. This has been a guiding document for bilateral ties. Last year Russian Prime Minister Dmitry Medvedev visited Cambodia as part of Russia’s ASEAN outreach. The countries then agreed to boost cultural, economic and defense ties, as well promote two-way tourism.